Dedicated to remembering the lost car makers, the orphaned brands that are such a rich and entertaining piece of American automobile history. While most vehicles end their lives in a junkyard, it is there that the 1300 Powell Sport Wagons built from 1955 to 1957 began theirs. Beneath the modern looking steel and fiberglass body of each of these sport utility vehicles lay the bones and innards of a 15-year old Plymouth plucked from the scrapheap. This noble act of recycling resulted in a whole new category of vehicle, the car-based utility truck. The Powell Sport Wagon was the brainchild of Hayward and Channing Powell, two brothers who got their start building radios in the 1920s. As the competition from bigger names like RCA and Crosley squeezed profits, they shifted their attention to motor scooters. Business was fairly robust right up until World War II. But when business resumed in the late 1940s, new challenges from the cheaper Cushman and more refined Vespa scooters made the Powells once again shift gears and rethink their place in the personal transportation business. Pehaps four wheels would be more profitable than two. The Powell brothers saw a market for a sportsmen’s car, one for guys like themselves who wanted the utility of a Jeep, but were willing to trade some off-road capability for a more comfortable driving experience. It could be argued that the PowellSport Wagon was not only appropriately named, but also the very first of what today we call a Crossover SUV. The design parameters the Powells laid down in 1953 were indeed similar to those of today’s Toyota RAV-4 or Honda CR-V. It had to drive with the ease and comfort of a car, but have the ruggedness and utility of a truck. Where the Powell diverged from the little luxury boxes on wheels, ubiquitous to every supermarket parking lot and elementary school pickup line today, was that this SUV was meant to be cheap to build and to buy. Those last two requirements were met by employing the time-tested practice of turning one man’s junk into another’s gold. The Powells tested prototypes that used the components of several best sellers of the past. They eventually settled on the chassis and drivetrain of the 1940-41 Plymouth, a car known for its robust engineering. These pieces were long out of production but they lay in abundance across the Salvage yards of Southern California. A decent chassis could be had for just $45, with an L-head engine and 3-speed gearbox for not much more. Powell representatives would collect the components and send then off to be refurbished and rebuilt by an outside supplier in Glendale. The reborn and now gleaming former Mopar bits were then shipped to the Powell factory down in Compton where they would be introduced to truly new bodies and interiors. Those bodies were made of stamped steel and had no compound curves, thus keeping costs down. Front end clips were made of fiberglass and molded by a local boat yard. 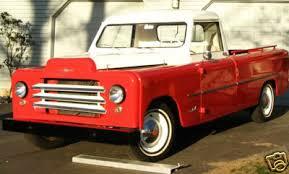 Bumpers and tailgates were initially made of oak wood, switching to steel in 1956 for safety reasons. Side windows were of the sliding glass variety in order to save on tooling. Seats were made of simple vinyl stretched over foam rubber pads rather than costlier springs. 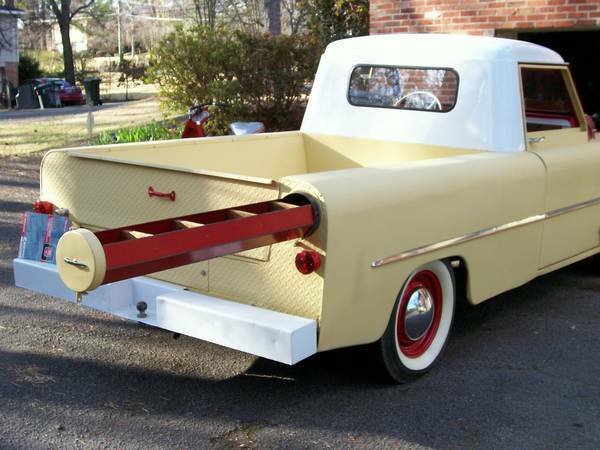 The one “luxury” feature on a Powell was a storage tube that slid out from a compartment between the truck bed’s inner and outer sheet metal. It was built to hold long thin items of the sportsman’s trade, like hunting rifles or fishing poles. When the Powell brothers shut down operations in 1957 it was not because of the financial troubles to which other post-war automotive start-ups had succumbed. 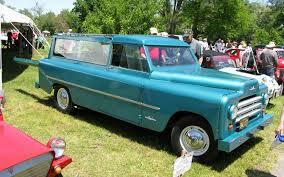 Powell Sport Wagons were cheap to build, and they sold profitably. But a business model that included a bunch of local junkyards as an integral part of the supply chain meant that Powell Motors was not built for the long haul. They simply ran out of used parts. 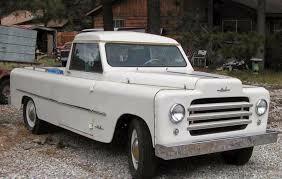 In more than two years of production, Powell Motor Company made over a thousand pickup trucks and about 300 station wagons. Most were sold in California, and almost none east of the Rockies. The Powell Registry lists 130 Sport Wagons still in existence.